With the freedom to re-brand the cloud services you resell with your own logo and colors, you’ll maintain a one-on-one relationship with each of your clients and prospective clients. AwesomeCloud will never contact your clients, unless you request our support. There are no monthly fees, minimum spends, hidden fees or additional bandwidth charges associated the our cloud reseller program. You only pay for the cloud services that you resell to your clients, which makes AwesomeCloud a revenue generating expense. You’ll always have the flexibility to offer tailored cloud services to each of your clients that can quickly be scaled up or down to meet seasonal demands. AwesomeCloud partners purchase the precise computing resources (CPU/RAM/HDD) to meet their clients’ unique needs. AwesomeCloud’s US-based support team is always available in the event of an emergency. If you ever need to get in touch, you contact the support team by email, phone (855.2.THECLOUD), or online support form. 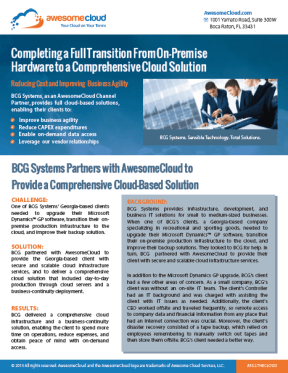 As a part of our partnership program, each of your clients will benefit from enterprise-grade cloud solutions. You’ll be offering custom solutions built on the latest technology from Cicso, Juniper, and Fortinet that are all and hosted at Verizon Terremark’s NAP of the Americas data center. With secure infrastructure, services, tools and processes, you can help your clients grow their business while you grow and thrive in the cloud-based services industry. To learn more about joining our partner program and becoming a cloud reseller, please get in touch via phone (855.2.THECLOUD), email, or by filing out our brief online form.